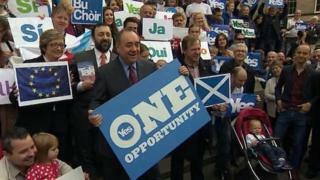 Image caption Bha Ailig Salmond ag iomairt ann am meadhan Dhùn Èideann. Dheadh àite na h-Alba san Roinn Eòrpa a neartachadh gu mòr ma bhòtas an dùthaich airson neo-eisimileachd, a rèir Ailig Salmond. Air thoiseach air referendum na h-ath-sheachdain, thuirt am Prìomh Mhinistear gu bheil Westminster a' cur suidheachadh na h-Alba san Aonadh Eòrpach ann an cunnart. Tha Riaghaltas na h-Alba a' cumail a-mach gum faigheadh Alba neo-eisimeileach ballrachd san AE taobh a-staigh 18 mìosan. Thuirt luchd-taic an Aonaidh ge-tà, nach gabh earbsa a chur ann an càil a chanas Mgr Salmond mun Roinn Eòrpa. Rinn am Prìomh Mhinistear, a bha ag iomairt ann an Ceàrnag na Pàrlamaid an Dùn Èideann, càineadh air gealltanas Dhaibhidh Camshron gus referendum a chumail air ballrachd na Rìoghachd Aonaichte san AE, ma nì na Tòraidhean an gnothach anns an ath-thaghadh. "Aig àm nuair a tha àm ri teachd na h-Alba san Roinn Eòrpa ga chur ann an cunnart le ceannardan Westminster a tha air am beò-ghlacadh le UKIP, tha e a' sìor fhàs follaiseach gur ann air muinntir na h-Alba a bu chòir uallach a bhith airson poileasaidh Eòrpach na h-Alba," thuirt Mgr Salmond. "Bidh Alba neo-eisimileach na ball dealasach den AE, mar thoradh air an fheallsanachd eadar-nàiseanta agus farsaing a bh' againn bho chionn fhada. "Bidh e comasach dhuinn argamaid a dhèanamh às leth na h-Alba agus aontaidhean nas fheàrr fhaighinn do thuathanaich, iasgairean is eile," thuirt e.
Bha ministearan na h-Alba ag ràdh bho thùs gum faigheadh Alba ballrachd san AE gun cheist, ach tha iad a-nis ag ràdh gum b' urrainn do dh'Alba tighinn gu aonta air ballrachd taobh a-staigh 18 mìosan. Rinn iomairt Nas Fheàrr Còmhla càineadh air na thuirt Mgr Salmond. Thuirt Leas-Cheannard nan Làbarach an Alba, Anas Sarwar: "Chan urrainn do dhuine earbsa a chur anns na tha Ailig Salmond ag ràdh mun Roinn Eòrpa - chaidh a ghlacadh mar-thà ag innse nam breug mu àite na h-Alba san Aonadh Eòrpach agus, an-diugh, tha e a-rithist air feuchainn ri brath a ghabhail air Albannaich a thaobh na tha an dàn dhaibh. "S e firinn na cùise gur e Ailig Salmond a tha ag adhbharach na mì-chinnt mu àite na h-Alba san AE às dèidh sgaradh bhon Rìoghachd Aonaichte, agus cha dèan na breugan aige do mhuinntir na h-Alba an gnothach," thuirt e.